Four further places to be decided on the concluding day of action, Sunday 5th November, in the Croatian coastal city of Split at the Buenos Aires 2018 Youth Olympic Games European Qualification Tournament, one name to reserve a place in the Argentine capital city next October was no surprise, the other names were not necessarily to be expected. 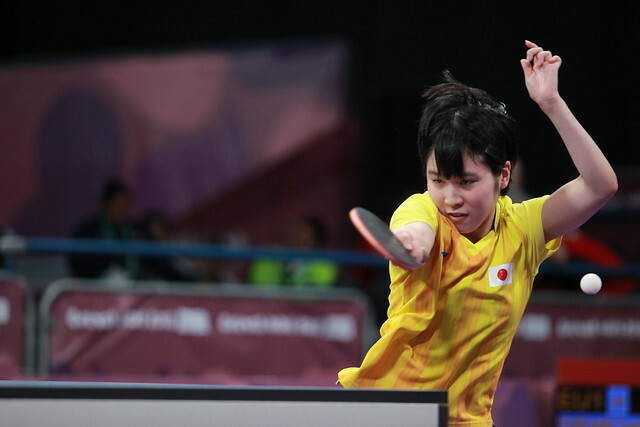 Azerbaijan’s Ning Jing the top seed, emerged successful in the Women’s event as anticipated, the place reserved by Nadezhda Bogdanova of Belarus, was somewhat of a surprise as was the success in the Men’s Singles event of Lithuania’s Medaradas Stankievicius and Moldova’s Vladislav Ursu. Nadezhda Bogdanova commenced proceedings as the no.10 seed; Medaradas Stankievicius was the no.11 seed, Vladislav Yrsu, the no.17 seed. Impressively, Nadezhda Bogdanova accounted for Sweden’s Christina Källberg, the no.8 seed (11-9, 11-6, 9-11, 11-8, 11-8), Germany’s Franziska Shreiner, the no.13 seed (11-5, 11-6, 10-12, 11-4, 12-14, 10-12, 11-4) and the host nation’s Andrea Pavlovic, the no.6 seed (16-14, 11-6, 11-9, 11-8). Outstanding from Nadezhda Bogdanova, her efforts were more than matched by Medaradas Stankievicius and Vladislav Ursu. Both went from strength to strength. Medaradas Stankievicius overcame Portugal’s José Pedro Francisco, the no.15 seed (11-8, 11-6, 9-11, 11-7, 9-11, 11-2), prior to ousting Azerbaijan’s Yu Khinhang, the player who on the opening day of action had accounted for Ioannis Sgouroploulos of Greece, the European Youth Champion (12-10, 11-9, 14-16, 5-11, 11-7, 10-12, 11-9). Victory by the narrowest of margins, it was only marginally more comfortable for Medaradas Stankievicius in the final as he caused an upset of note. He beat Italy’s Matteo Mutti, the no.6 seed (14-12, 13-11, 12-10, 1-11, 8-11, 11-9). Hard fought contests; it was no different for Vladimir Ursu. He overcame Ukraine’s Volodymyr Lushnikov, the no.21 seed (10-12, 11-6, 11-9, 13-11, 6-11, 11-1) as was anticipated but then upset the odds by accounting for Belgium’s Laurens Devos, the no.9 seed (11-6, 9-11, 11-5, 12-10, 9-11, 11-8) and Frenchman Bastien Rembert, the no.5 seed (11-5, 9-11, 11-3, 11-8, 7-11, 11-9). Notably one round earlier Bastien Rembert had beaten Sweden’s Truls Moregard, the no.4 seed (12-10, 11-6, 7-11, 16-18, 11-6), the opening round winner in opposition to Romania’s Cristian Pletea, the top seed (7-11, 11-7, 9-11, 14-12, 2-11, 11-7, 11-7). A series of upsets, for Ning Jing, it was as predicted. She beat Anna Wegrzyn, the no.11 seed (11-5, 13-11, 12-10, 11-6), Romania’s Andreea Dragoman, the no.3 seed (11-6, 8-11, 11-8, 8-11, 11-3, 11-5) and Ukraine’s Veronika Perebeinos, the no.18 seed, to reserve her Buenos Aires place (11-1, 11-2, 11-7, 9-11, 11-4). Meanwhile, in the contests to decide the first reserve; in the Men’s Singles event, Matteo Mutti beat Bastien Rembert (11-8, 11-5, 11-9, 6-11, 11-6), in the Women’s competition, Andrea Pavlovic overcame Veronika Perebeinos (11-4, 11-3, 11-7, 11-6). Buenos Aires 2018 Youth Olympic Games 2017 European Qualification Ning Jing Nadezhda Bogdanova Vladislav Ursu Medardas Stankevicius.